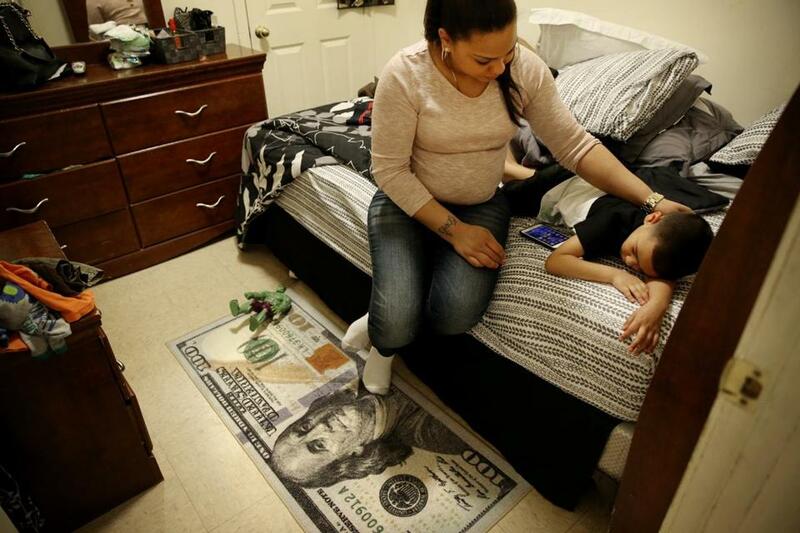 Lany Ruiz comforted her son, Alex, 5, in her bedroom at their home in the lower South End of Boston. Jennifer Colón lives on the edge of Grove Hall, a humble collection of yellow-brick apartment buildings and takeout restaurants in the heart of Boston’s growing stretch of high-poverty neighborhoods. Median family income is $26,538. More than half of the households are on food stamps. And the neighborhood, just north of Franklin Park, has one of the highest rates of rodent infestation and building maintenance problems in the city. Last summer, when Colón heard gunshots outside her building, she hustled her three children into the shower stall and peered out of the window, where she saw a young man bleeding to death on the street. Oh my God, she thought, I need to get out of here. Colón, who does part-time office work at a nonprofit agency that provides health care for seniors, has managed to move to a safer block in the neighborhood since then. But she imagines a life much farther away. Income falls in Eastern Mass. At least 10 Greater Boston communities saw income fall 15 to 30 percent, while two-thirds saw smaller declines. When she’s on her way to Walmart in Quincy or her cousin’s house in Framingham and the kids are asleep in the back seat, she takes the long way through the region’s growing number of high-end suburbs and pictures her family in one of the big houses with the sloping lawns. In a region known for its searing struggles with racial division, another once-secondary form of segregation — income segregation — has become a defining force. In 1970, just 8 percent of families in Boston and the surrounding cities and towns lived in the poorest neighborhoods. Now, the figure is more than twice as high — 20 percent. Over the same period, the proportion of families living in the wealthiest neighborhoods has nearly tripled, from 6 percent to 16 percent. The surge in affluence in some areas and poverty in others has wiped out scores of mixed-income neighborhoods. In 1970, 7 in 10 families lived in these places. Now it’s just 4 in 10. That’s according to data that sociologists Kendra Bischoff of Cornell and Sean F. Reardon of Stanford provided to the Globe at its request. They also computed figures for the rest of Eastern Massachusetts. Over the last several months, the newspaper has mapped it all — an atlas, in orange and green, of a region pulling apart, with hundreds of thousands living in an economic isolation unlike anything in memory. It is a pattern repeating itself all over the country, from Bridgeport, Conn., to Greenville, S.C., Chicago, and Los Angeles. Blue- and white-collar families who once lived close enough to bump into each other in the aisles of the local hardware store or chat in the pews of the neighborhood church live in much more homogenous places now. Low-income people can go an entire day without talking to someone who has a college degree or a job in a downtown office. And for the affluent, handing a credit card to the gas station attendant or grocery clerk may be their only weekend brush with blue-collar America. Robert D. Putnam, a Harvard social scientist, argues that the biggest threat to national cohesion is not the income inequality that has drawn so much scrutiny from the news media and the political class, but the social segregation that inequality has helped to create — in where people live, where they go to school, and whom they marry. Low-income people bear the brunt of the new segregation. Research shows that poor kids who grow up in poor neighborhoods attend college at lower rates, earn less money as young adults, and are more likely to become teenage parents than poor kids who grow up in better-off neighborhoods. The impact on the wealthy is not as well understood. But Reardon, the Stanford sociologist, says life amid the cul-de-sacs and condominiums of upper-income enclaves could leave people with only an abstract feel for the lot of the poor, dampening their enthusiasm for investments in inner-city schools and health clinics. Pedestrians crossed the Duck Bridge on South Union Street in Lawrence. | Homes on Rosemont Drive in North Andover Estates. Frank Kenneally, 48, an administrator at the Merrimack Valley YMCA, worries about isolation on both sides of the economic spectrum. He grew up in North Andover, then a small town of farmers and factory workers that was just starting to transition into a bedroom community. And he used to travel to neighboring Lawrence all the time to visit his grandparents, Irish immigrants drawn to the city’s towering mills. But the two communities, about 30 miles north of Boston, have been on very different trajectories since the 1970s. North Andover has become one of the wealthiest towns in the state, its farmland giving way to so many Cape Codders and Colonials that Kenneally sometimes gets lost in the subdivisions. Lawrence, meanwhile, has struggled with deepening poverty — large stretches of its industrial firmament a spectacular ruin of broken brick and shattered glass. In a bid to bridge the divide, Kenneally has established a group of 60 middle- and high-school-aged kids from Lawrence, North Andover, and Andover. In June, they took a steel-hulled boat out to a century-old camp on Bear Island in Lake Winnipesaukee, where they worked through a ropes course and water-skied together. The connection, the teenagers say, was genuine. But there were limits. In one of the weekend’s final exercises, they gathered in a wooden lodge overlooking the lake and fielded a series of difficult questions about whether they’d ever been through a divorce in the family, or felt abandoned, or heard gunshots outside their homes. To answer “yes,” the teens were told, they had to walk across a line on the floor. In some cases, a mix of kids from all three towns crossed over. But in others, it was mostly Lawrence kids who stepped over the line and turned to face their peers. The new friends, looking at each other across the divide, were shaken. The world of the affluent does increasingly seem a world apart. In Manchester-by-the-Sea on the North Shore, some of the locals jokingly refer to the neighboring blue-collar city as Gloucester-by-the-Smell. Foreign Affairs Wine Bar & Bistro serves up guinea hen with carrots, garlic mashed potatoes, and lemon garlic thyme jus in Manchester’s quaint downtown. And at Christmastime, Santa Claus arrives by boat for the annual Jingle Bell Walk. The town has a long history of affluence. In the late 19th and early 20th centuries, wealthy families from Boston and beyond built a series of sprawling “summer cottages” in Manchester with names like Sharksmouth and The Marble Palace. But there was a sizable blue-collar presence in town, too: municipal workers, lobstermen, and teachers. In 1970, median family income was a middle-of-the-road $12,677. Some of the older Manchester residents are still around, but many say they feel squeezed by the town’s mounting wealth. Gail Halloran, 58, a retired park ranger out walking her dog on a recent afternoon, said some of her friends had been forced to build on their parents’ land just to afford a place in Manchester. Her own neighborhood has gone increasingly upscale, pushing property taxes higher and higher. Many in the professional class have migrated into The Village and the surrounding neighborhoods in search of high-quality schools. And there are plenty in town. At Manchester Essex Regional High School, where Volvos and Lexuses dot the parking lot and the golf team plays at the country club next door, fully 98 percent of graduates go on to college. The yearning for that sort of suburban school seems so commonplace now, it’s hard to remember a time when it wasn’t such an urgent priority for families of means. But Reardon, the Stanford sociologist, says it has ramped up considerably in recent decades amid shifting views on education. In 1983, a commission convened by President Ronald Reagan’s administration released an influential report called “A Nation At Risk,” which savaged the country’s schools for “a rising tide of mediocrity” that was squandering America’s competitive advantage in the global economy. The report came amid mounting concern about the flight of manufacturing to the American South and overseas; no longer could an uneducated person count on a solid factory job in Lawrence or Pittsburgh or Detroit. Just as the pursuit of higher-quality education was rising, the school accountability push of the 1990s and the No Child Left Behind law of 2002 spawned reams of test scores easily accessible by desktop computer. The upshot is jarring: University of Southern California sociologist Ann Owens, in a paper set for publication in the June edition of American Sociological Review, shows that the growth in economic segregation nationwide between 1990 and 2010 occurred almost entirely among families with children. That means a higher proportion of kids in largely poor or largely wealthy neighborhoods. And for the sons and daughters of the well-off — surrounded almost entirely by high achievers, now — the pressure to perform can be intense. At Duxbury Student Union, an after-school program on the increasingly wealthy South Shore, it bubbles up as early as elementary school. “We’ve noticed it working with the third-graders or the fifth-graders: ‘Oh, I picked oboe for my instrument because my mom and dad said that’s how I’m going to get into a really good college,’ ” said Allison Berry, the board president. The Student Union is part of an expanding infrastructure of support groups and itinerant speakers catering to well-to-do families eager for their children to land on the right side of an increasingly unequal society, but also worried about the stress that comes with the striving. 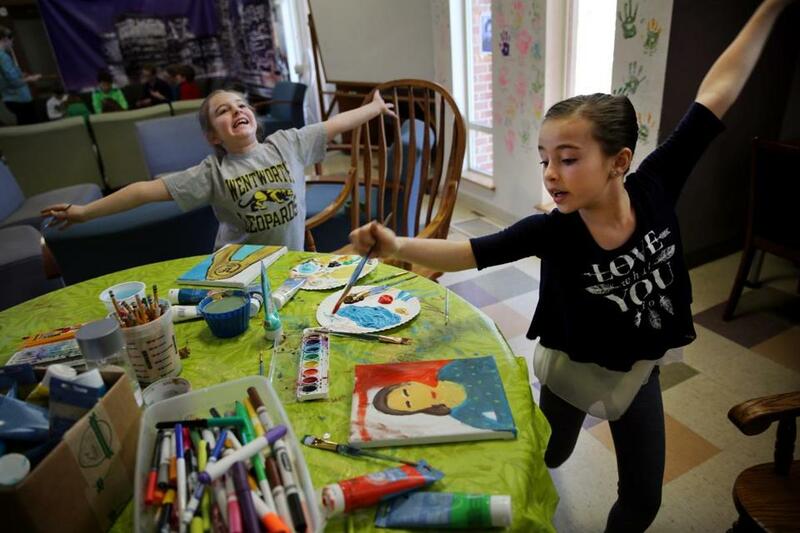 From Left: Ania Manning, 9, and Autumn Cooney danced while painting self-portraits during "Selfie Camp" at the Duxbury Student Union. For middle schoolers at the Student Union, there is an executive functioning program called CEO, where they learn to manage crowded academic schedules and bring order to their backpacks. Berry said many Duxbury teenagers are less interested in a jobscooping ice cream than a volunteer opportunity that might improve their college admission prospects. And the Student Union arranges outings of all kinds. Some are eye-opening for kids who are not exposed to poverty with any regularity. No, she assures them, no one from Pine Street is coming to Duxbury. Reardon and Bischoff, the sociologists who provided the Globe with the economic segregation data, have tracked the trend in the nation’s 117 largest metropolitan regions — sorting every US Census tract in those areas into one of six categories based on median family income. In the poorest tracts, family income is less than two-thirds of the median for the whole region. In the wealthiest, it’s more than 150 percent of the median. The range for middle-class neighborhoods is 80 to 125 percent. A research update they’re releasing Sunday, combining census data from 2010 to 2014, shows that the residential divide between rich and poor has continued to grow since the Great Recession. 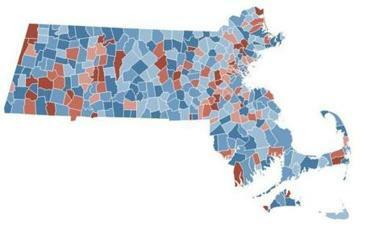 Some parts of the country are even more segregated by income than Eastern Massachusetts. In New York City and the surrounding region, fully half of families live in either the poorest or wealthiest neighborhoods. But some of the most dramatic change over time has occurred here. Since 1970, the proportion of families in the Worcester area living in either the poorest or wealthiest neighborhoods has surged from 2 percent to 24 percent. In a census region reaching from the salt-sprayed ports of New Bedford and Fall River to Providence, the number has increased sixfold, from 5 percent to 30 percent. And in Essex, a diamond-shaped county north of Boston that stretches from Lawrence, through the bedroom communities of Merrimack Valley, and out to the saltwater taffy shops of Rockport, the figure has quintupled, from 7 to 36 percent. All of these regions have seen sharper growth on the low-income side than on the affluent side. And that’s the case in some other parts of the country, too. But the geography of deprivation looks different here than it does elsewhere. In much of the mid-Atlantic, the South, and the Midwest, poverty starts in the central cities and radiates out into aging suburbs, where low-income families hunker down in extended-stay motels or small, tired apartments, and do their shopping at rundown strip malls. In Eastern Massachusetts, though, where the suburbs are so expensive and their zoning rules so tight, the poor are concentrated in just a handful of places. Beyond the Interstate 95 belt, neighborhoods in a few old industrial cities — Haverhill, Lawrence, and Lowell to the north, Framingham to the west, and Brockton to the south — form an archipelago of poverty in an ocean of enormous suburban wealth. Inside I-95, there are a handful of poor cities just north of Boston, like Everett and Chelsea. And in Boston itself, much of the poverty is fixed in a six-mile stretch that starts with the cramped apartments of Chinatown and runs down the center of the city, through Roxbury and into large swaths of Dorchester, like Uphams Corner and Fields Corner, that were mixed-income just a few decades ago. That cluster appeared in white and gray on a map of Boston poverty that Harvard social scientist Robert Sampson pulled up on his office computer one afternoon last fall. And every map he called up afterward — charting patterns of domestic violence, housing neglect, and medical emergencies — covered almost the exact same ground. The story of economic segregation, in other words, is a story of compounded advantage on one side and compounded disadvantage on the other. And all of it, Sampson said, is deeply tied to race. “At some fundamental level, we don’t even have a way to compare white with black neighborhoods,” he said, arguing that they are so different as to be beyond compare. Mattapan is one of many neighborhoods in the region that have seen a dramatic shift in class and color in recent decades. In the early to middle part of the 20th century, blue-collar and middle-class Jews filled Mattapan’s Colonials and triple-deckers, leafing through Yiddish-language newspapers and heading up to G&G Delicatessen on Blue Hill Avenue for kishke, tongue on a roll, or cheesecake. Their migration to the suburbs began in the 1920s, but was hastened by a concerted effort at “block-busting” in the late 1960s — real estate agents encouraging panic selling as blacks started to arrive in the neighborhood. Those who left swelled Jewish congregations in Newton, Brookline, and Sharon and built the dense social networks that keep the well-to-do thriving — the friend at a law firm who can help with the next job or the next-door neighbor who can get the grandkid an internship in a downtown high-rise. The blacks who integrated Mattapan built a lively neighborhood of their own, with romances kindled over chicken and macaroni-and-cheese at Brothers Deli in Mattapan Square and a small middle class shuttling their children off to private high schools or Howard University. But they are quick to acknowledge that decades of poverty and isolation have inflicted heavy damage on the social structure. Sharon Scott-Chandler, executive vice president at the antipoverty agency Action for Boston Community Development, which has an office in Mattapan, says the crack epidemic of the 1980s was a turning point. She remembers the moment the change registered for her. Chance still connects with her neighbors at Morning Star Baptist Church, where she oversees a chicken and waffles breakfast on the first Sunday of the month, grits and bacon on the third, and breakfast sandwiches on the fourth. But her children and grandchildren are less interested in church. It is a trend confirmed by a University of Michigan survey of high school seniors that found many young people in neighborhoods like Mattapan are pulling away: Church attendance is dropping twice as fast for those in the lower third of the socioeconomic distribution as for those in the upper third. If blue-collar people are less connected to one another than they were in previous decades, the ties between working-class people and the professionals who were once their neighbors have all but snapped. Lany Ruiz (center) sat with her children Joshua Ruiz, 18-months (left) and Alex, 5, while they played in the boys bedroom. Lany sat on the unassembled bunk beds she recently bought with her tax return. Lany Ruiz, 31, who lives in a subsidized three-bedroom apartment where the South End meets Roxbury, said she doesn’t know any professors, lawyers, or other white-collar types who might help usher her kids into another strata. It’s not that she never crosses paths with the well-to-do. She sees them all the time at the posh downtown hotel where she works as a housekeeper. But the interactions, she said, are often silent. As the wealthy and the poor have retreated into their own corners, they’ve built what can only be called parallel economies. Brockton, once powered by shoe manufacturers like Walk-Over and FootJoy, is increasingly reliant on low-paying service sector jobs and public expenditures on Medicaid and welfare. One-third of the city’s households are on food stamps. And at Vicente’s Supermarket, a low-slung grocery on Main Street that sells codfish, canned mandarin oranges, and Sumol brand soft drinks favored by the city’s sizable Cape Verdean population, sales spike when customers’ benefits land. “You can definitely see it,” said Kevin Barbosa, who does the accounting for the market. “At the beginning of the month, it’s usually busy, and in the middle of the month, too.” Management, he said, ramps up food buys during these periods to keep the shelves stocked and increases staff hours by about 20 percent. A few towns over, in Duxbury, the scene is very different. On Washington Street, a Waterfront Realty sign hanging outside a $5.5 million estate offers up two black-and-white QR codes for smartphone users — one linking to an online tour of the house’s interior and another to an aerial tour of the entire property, with sweeping views of the ocean. Wong’s son grew up with a tight group of friends and went on to the US Air Force Academy. Her youngest daughter is taking American Sign Language and had a nice moment, a little while back, communicating with her teacher’s deaf husband in the stands at a football game. Tim and Hollie Baggs have their own ambivalence about life in a wealthy town. Tim, 45, grew up in a blue-collar section of East Boston, and Hollie, 39, was raised in Burlington. Her dad was a firefighter who worked a number of side jobs to help pay the bills; when he was driving a delivery truck for the local butcher, Hollie rode shotgun in a lawn chair. The Baggses now live in a handsome Colonial in North Andover with a two-car garage and woods in the back. Their neighbors include a nuclear physicist, a marketing consultant, and a vice president of sales. Tim is a solution architect at Microsoft. Hollie has converted some old factory space in town into The Maker Mill, a STEM (science, technology, engineering, and math) enrichment center where kids learn coding, build BattleBots, and create stop-motion animation films. They are happy with the life they’ve built. But they worry that their children, surrounded by so much affluence, might grow up with a skewed perspective. 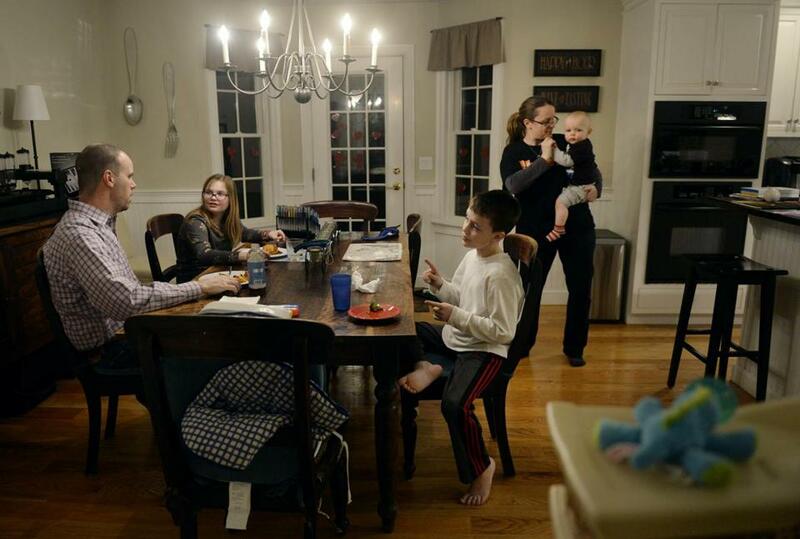 In North Andover, Tim and Hollie Baggs worry about how growing up surrounded by affluence will affect their children. When they bought backpacks and school supplies for disadvantaged children, they made sure the kids were involved. And they’ve held off on getting their 12-year-old daughter Haley a smartphone, even though most of her friends have one. Tim’s old neighborhood in East Boston was a bit of a jumble: a row of modest, well-kept houses; the Italian neighbors who invited his family over on Christmas Eve for fish and pasta; and the occasional burst of violence on the street. There is still some of that mix in Boston. But economic integration, these days, often looks quite different: the intense poverty of a public housing development or homeless shelter amid the vaulting wealth of the South End or Charlestown. Sociologists say low-income families can benefit from that sort of close proximity to wealth. It can mean better schools and parks, they say, and those institutions are critical for upward mobility. 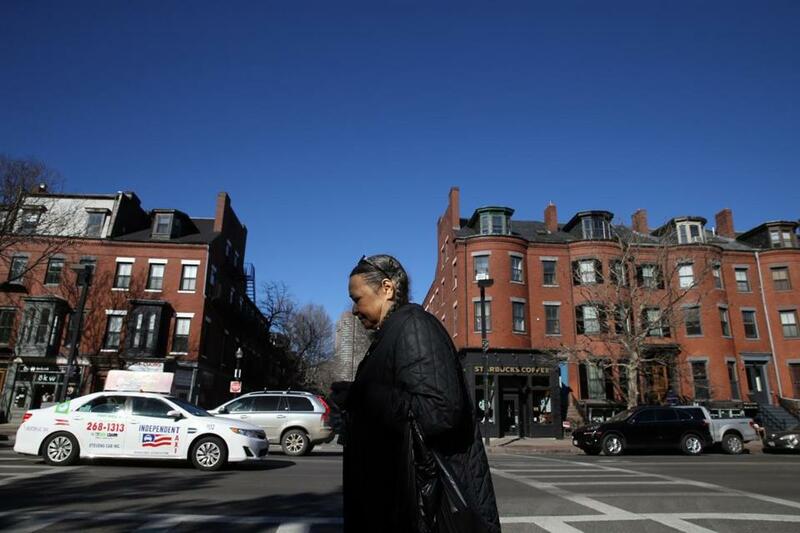 Vanessa Calderón-Rosado, chief executive of the nonprofit that runs the Villa Victoria housing development in the South End, said some of her longtime residents feel safer now that the neighborhood has become more affluent. But there is friction between the development and its well-off neighbors. While some of the white-collar locals visit Villa Victoria’s festivals or volunteer in its preschool program, Calderón-Rosado said, many are quick to blame residents for loud music at night or to complain about their failure to participate in community meetings. “I try to explain that, when you’re very poor, perhaps going to a meeting a month to talk about trash, or dog parks, or the Blackstone Park fountain — it’s not the first priority in their lives,” she said. Carmen Barrientos, 69, a decades-long resident of Villa Victoria, has warm memories of a more blue-collar and Latino South End. The new businesses, she said, feel foreign to her. She’s been to a nearby tea shop a few times and they’ve treated her just fine. But she doesn’t go to any of the upscale restaurants or salons or gift shops. Barrientos looked down at her small breakfast table. Carmen Barrientos has seen many changes in the South End over the past 60 years. David Scharfenberg can be reached at david.scharfenberg@globe.com. Follow him on Twitter @dscharfGlobe.